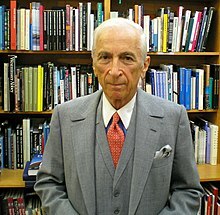 Gay Talese (born February 7, 1932) is an American author. As a writer for The New York Times and Esquire magazine in the 1960s, Talese helped to define literary journalism. Talese's most famous articles are about Joe DiMaggio and Frank Sinatra. I think most journalists are pretty lazy, number one. A little lazy and also they're spoon-fed information, such as the weapons of mass destruction back in 2003.... you have these people who create a package of news, develop it as a story line, a scenario, and they find, as Mailer once said about the press, that they're like a donkey. You have to feed the donkey. The donkey every day has to eat. So [special interests] throw information at this damn animal that eats everything. Tin cans, garbage. Interview with Gay Talese, David Shankbone, Wikinews, October 27, 2007. If you're a child of store owners, if you're brought up in a store, you learn good manners. You have to be genial, well-liked. You're not going to sell a customer if you're rude. You also get with different age groups, and different types of people. So be respectful. Being respectful is very important. You have to learn this. Sometimes it's good to be an outsider, especially as a journalist. You should be proud of your profession because there's less lying in journalism than in any other profession. They lie in education, they lie in politics, they lie in banking, they lie in labor; there's liars all over the place. Sports? Full of liars. And there are liars in journalism, but if there are liars, journalism will out them. Sinatra with a cold is Picasso without paint, Ferrari without fuel — only worse. He seemed now to be also the embodiment of the fully emancipated male, perhaps the only one in America, the man who can do anything he wants, anything, can do it because he has money, the energy, and no apparent guilt. ... The man who had everything, lost it, then got it back, letting nothing stand in his way, doing what few men can do. Words that warmed women, wooed and won them, snipped the final thread of inhibition and gratified the male egos of ungrateful lovers; ... for which they were eternally in his debt, for which they may eternally hate him. Sinatra brings out the best and worst in people. All the Way; All or Nothing at All. This is the Sicilian in Sinatra; he permits his friends, if they wish to remain that, none of the easy Anglo-Saxon outs. But if they remain loyal, then there is nothing Sinatra will not do in turn — fabulous gifts, personal kindnesses, encouragement when they're down, adulation when they're up. They are wise to remember, however, one thing. He is Sinatra. The boss. Il Padrone. He is what in traditional Sicily have long been called uomini rispettati — men of respect: men who are both majestic and humble, men who are loved by all and are very generous by nature, men whose hands are kissed as they walk from village to village, men who would personally go out of their way to redress a wrong. He is a wholly unpredictable man of many moods and great dimension, a man who responds instantaneously to instinct — suddenly, dramatically, wildly he responds, and nobody can predict what will follow. The whole thing had lasted only about three minutes. And three minutes after it was over, Frank Sinatra had probably forgotten about it for the rest of his life — as Ellison will probably remember it for the rest of his life: he had had, as hundreds of others before him, at an unexpected moment between darkness and dawn, a scene with Sinatra. It was suddenly obvious to everybody in the studio that something quite special must be going on inside the man, because something quite special was coming out. He was singing now, cold or no cold, with power and warmth, he was letting himself go, the public arrogance was gone, the private side was in this song about the girl who, it is said, understands him better than anybody else, and is the only person in front of whom he can be unashamedly himself. He never knows whether they want him for what he can do for them now — or will do for them later. They stopped at The Sahara, taking a long table near the back, and listened to a baldheaded little comedian named Don Rickles, who is probably more caustic than any comic in the country. His humor is so rude, in such bad taste, that it offends no one — it is too offensive to be offensive. When Sinatra sits to dine, his trusted friends are close; and no matter where he is, no matter how elegant the place may be, there is something of the neighborhood showing because Sinatra, no matter how far he has come, is still something of the boy from the neighborhood — only now he can take his neighborhood with him. It no longer matters what song he is singing, or who wrote the words — ​they are all his words, his sentiments, they are chapters from the lyrical novel of his life. Frank Sinatra stopped his car. The light was red. Pedestrians passed quickly across his windshield but, as usual, one did not. It was a girl in her twenties. She remained at the curb staring at him. Through the corner of his left eye he could see her, and he knew, because it happens almost every day, that she was thinking, It looks like him, but is it? Just before the light turned green, Sinatra turned toward her, looked directly into her eyes waiting for the reaction he knew would come. It came and he smiled. She smiled and he was gone. Katie Roiphe (Summer 2009). "Gay Talese, The Art of Nonfiction No. 2". "Gay Talese talks with David L. Ulin". The Los Angeles Times. October 15, 2010.